The history of Citroën is the tale of a visionary carmaker. 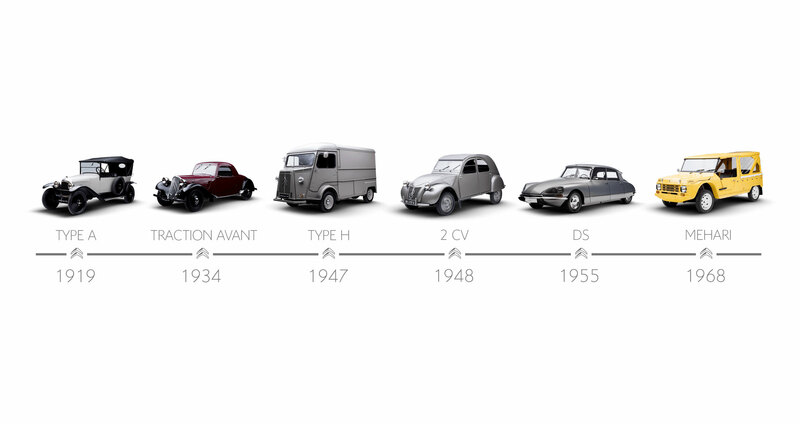 Like the most talented inventors and CEOs in history till today, André Citroën had a vision. He wanted to make cars more accessible to everyone. He revolutionised European automotive manufacturing, inspired by the American model of mass production. 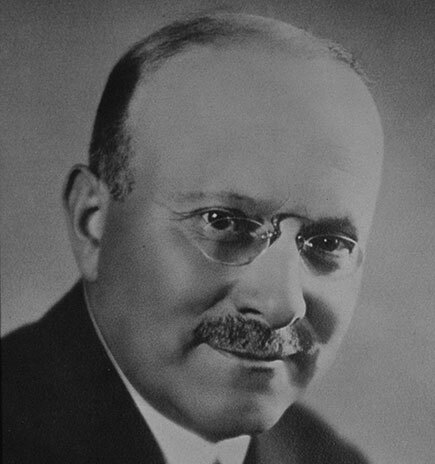 André Citroën also was a dreamer. He pushed advertising into a new era with imaginative and unseen-before campaigns. He is to be considered as the inventor of modern communication. 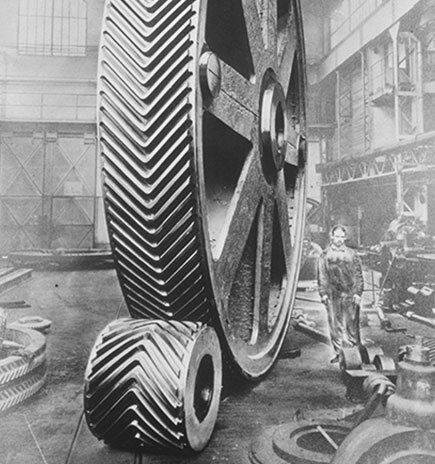 1905 - At 27, André Citroën creates his first company by exploiting a patent of gears in the shape of rafters. It will become the emblem of the brand. 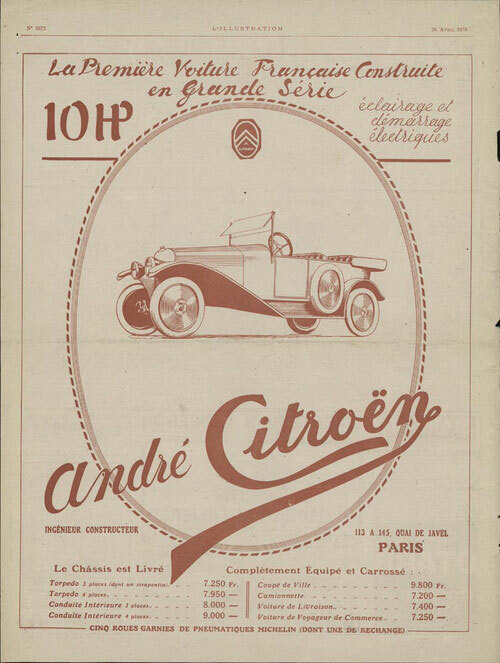 1919 - André Citroën creates his eponymous brand. 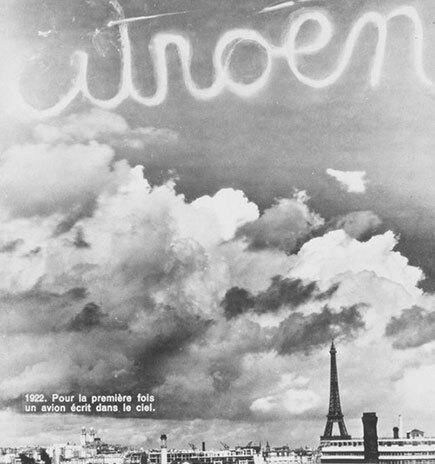 1922 - A world premiere for the opening of the seventh Paris Motor Show: an aircraft writes the brand name in the sky. 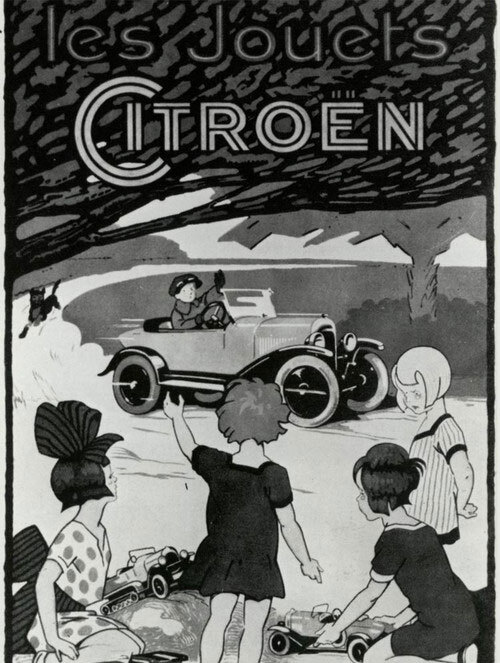 1919 - Advert for the launch of the Type A, Citroën's first vehicle. 1922 - To highlight the qualities of his half-track vehicles launched in 1922, André Citroën decides to send them across the Sahara desert. 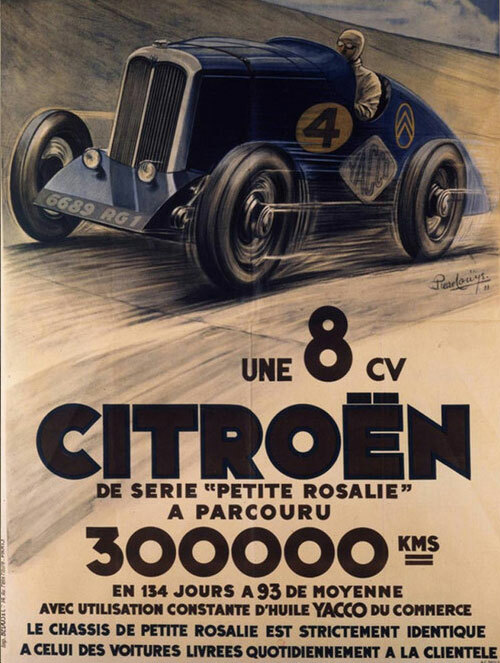 1923 - Always in search of visionary and original ideas, André Citroën started making miniature replicas of 'dad's car'. More than 30,000 toy cars were sold in the first ten years. Across ages our designers have conceived iconic models that have always pushed further people’s freedom to move. These models adapted people’s live and made mobility always more accessible and smoother. From 1919 to 1959, changes in the logo led to the disappearance of the A and to the transformation of the oval into a blue octagon. In 1984, the double white chevron was placed on a red square. A strong visual identity, based on the “Les chevrons sauvages” (the wild chevrons) promotional film. Since 2009, the Citroën name has been written in red beneath rounded 3D-effect silver chevrons on a white background. 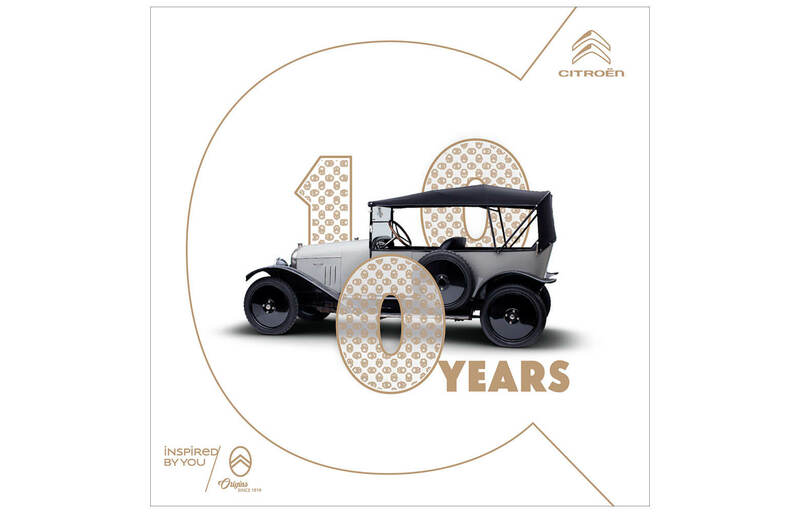 Because Citroën has always had a special relation with its customers, making it the most collected automobile brand today, we’ve developed Citroën Origins. It offers an original and immersive experience of the brand’s iconic models: 360° views, specific sounds for each model, stories from the period, and much more. For its centenary, Citroën has published a collector's catalogue that takes us through the features and history of the 30 iconic models exposed at the Rétromobile 2019 exhibition. An opportunity to travel back in time! Star of the Rétromobile Paris 2019 exhibition, Citroën celebrated its Centenary by showcasing 30 of its vehicles: iconic models, legendary concept-cars, and stars of racing and rallying. Citroën has always been a very popular Brand. Some families have written their own story, from one generation to another, with a bit of help from Citroën. By doing so, they have written the story of Citroën itself. 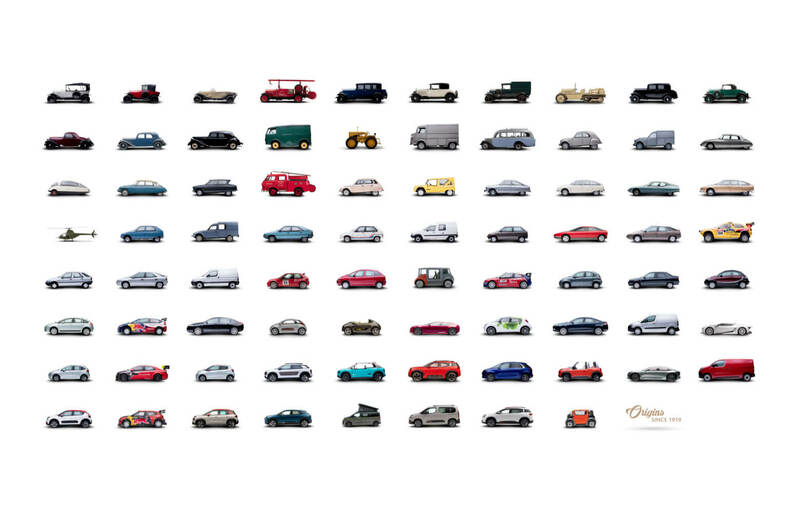 For its 100th birthday, Citroën wanted to celebrate these stories.